APPSC Panchayat Secretary Result 2019 – Andhra Pradesh Public Service Commission, Vijayawada (APPSC) will declare the APPSC Panchayat Secretary Result 2019. The result will be declared at the official website i.e. psc.ap.gov.in. For checking the result candidates will need to enter the login credentials at the login page. The separate result will be declared for each stage. The result will be based on the performance of the candidates. From this page, candidates will get full information regarding APPSC Panchayat Secretary Result 2019. After checking result candidates should take the print out of it for future reference. Result will contain the name of the qualified candidates. For more information regarding APPSC Panchayat Secretary Result 2019 check the schedule given below. Result: The APPSC Panchayat Secretary Result 2019 will be available at psc.ap.gov.in. After the releasing of the final answer key of the screening test, the result for that will be declared. Result will be declared at the official website. The result will be based on the performance of the candidates and it will contain the name and roll number of the qualified candidates. Candidates can follow the steps given below for checking the result. 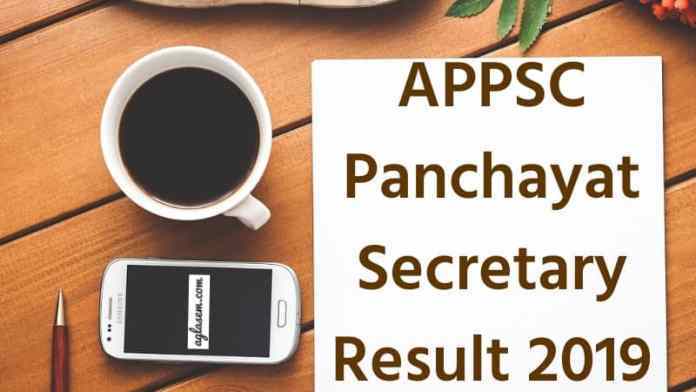 How To Check APPSC Panchayat Secretary Result 2019? Candidates can follow the steps given below for checking the APPSC Panchayat Secretary Result 2019. After checking the result candidates should take the print out of it for future reference. Thereafter, the login page will appear. In the login page fill the login credentials. After filling all the login credentials, hit the enter button. Thereafter, the result page will appear on the screen. Click at the download option for downloading the result. After releasing the answer key of the mains examination, the result for that will be declared. The result will contain the name of the qualified candidates. The result will be based on the performance of the candidates in the mains examination. Candidates can follow the steps given above for checking the result of mains exam. At first screening test will be conducted the candidates who will qualify in the screening test by scoring minimum qualifying marks those will be shortlisted for the next round that is mains examination. The candidates who will qualify the mains both the paper those will be selected for the final round that is interview round. The candidate who will qualify the final round those will be finally recruited for the applied post. But if the candidates fail to show up the documents on the day of the document verification or of the candidates found ineligible those will be not taken into the consideration for the recruitment process. Minimum Qualifying Marks – The minimum qualifying marks are 40% for General (OCs), 35% for BCs,, and 30% for SCs, STs, and PHs. The candidates who will be recruited for the post of Panchayat Secretary Grade IV those will be given the pay scale of Rs.16,400 – 49,870.